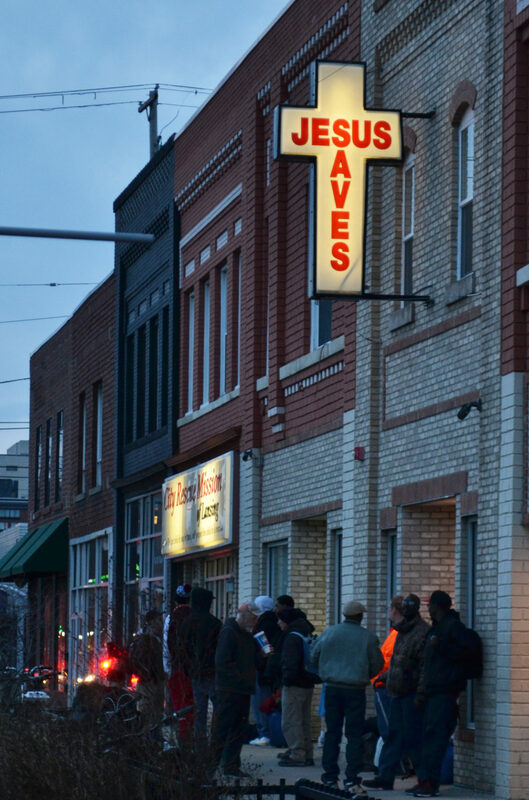 On Feb. 20 2017, a small group begins to gather outside of City Rescue Mission of Lansing. Laura Grimwood, the communications director at the City Rescue Mission of Lansing, said she feels lucky she felt to be able to help people in need. On average, the shelter houses about 140 people a night. Depending on the weather conditions, that number can change. “Our max we can house is dependent on our staff that day. Right now with the cold temperatures we are housing about 170 people a night. We could maybe shelter another 10 or so but not regularly,” said Grimwood. The Volunteers of America, also located in Lansing, is an organization that helps people in need of shelter, food and a wide variety of support systems. Alex Brodrick, the president and CEO, has been working at the organization for 35 years and said he loves what he does. Gina Malcangi, a volunteer at the City Rescue Mission of Lansing, said she loves being able to impact other people in a positive way. Malcangi also said when the number of people looking for help during the winter months goes up drastically, it reminds her how fortunate she is.